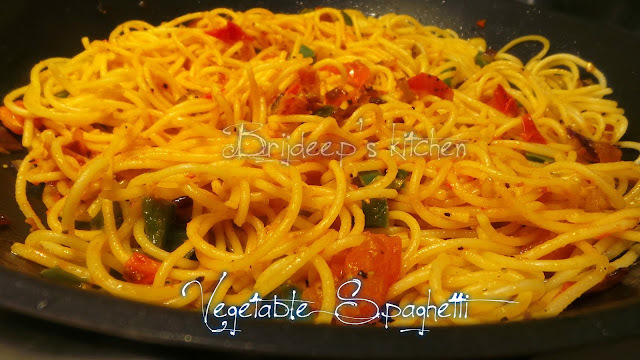 Simple, quick and easy option for lunch/dinner which doesn't require much time and efforts: vegetable spaghetti. This is also a great option for lunch box. Fill up a pot 1/2 with water, add a pinch of salt and bring it to a boil. 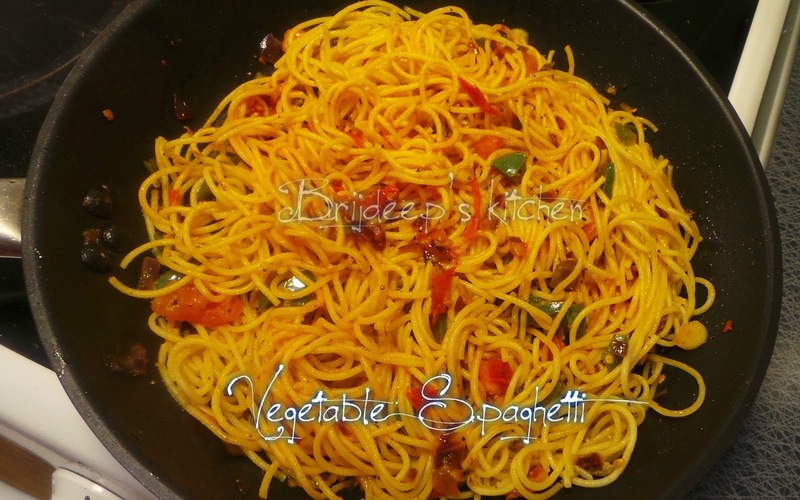 Add the spaghetti according to the instructions on the pack and let cook until its al dente. Drain in a colander over the sink and keep the spaghetti aside. Heat oil in a pan and add the chopped garlic and fry until its brown. Add the onions and fry until they turn transparent. Add the diced capsicum and sprinkle a little salt. Mix and let cook until the capsicum is done, it should break with the ladle but still has a crunch in it. Add the tomato and sprinkle red chilli powder, mango powder and mix well. Let cook until the tomatoes are soft and mushy. Add the boiled and cooked pasta to the pan and mix well. Sprinkle little water to loosen up the pasta if required. Sprinkle the black pepper powder, dried oregano, chili flakes and the tomato ketchup. Give a good stir and let cook for about 2-3 minutes more. Turn off the flame and serve hot. Loved this recipe? Please do share your feedback and leave a comment in the comments section below. Don't forget to connect with me on Facebook for regular yummy updates.